The GWE-LPS-BLK Hard-Shell Wood Case for Single-Cutaway Guitars such as Gibson Les Paul is lightweight, ultra-slim, and designed to protect against the minor bumps and bruises of daily use. Ultra-durable plywood coated in black Tolex PVC forms a moisture-resistant, impact-resistant outer barrier while plush fabric lining keeps your single-cutaway guitar stable. The large interior storage compartment fits everything from straps and tuners to picks and capos. Chrome plated lockable latches form a secure enclosure and the ergonomic carrying handle perfectly balances the case’s weight and gives you a comfy grip on your gear. 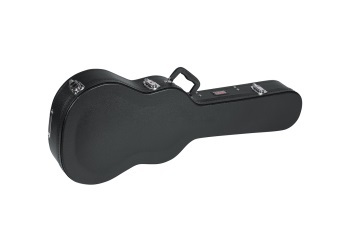 Keep your Gibson Les Paul® guitar safe and sound with the Gator GWE-LPS-BLK hard-shell wood case.